This summer I read the Fablehaven series at the request of some friends, and I was completely hooked. I haven't been THAT engrossed in a series since Twilight & Harry Potter. The world that Brandon Mull created is one I would LOVE to live in, and something I couldn't stop thinking about. 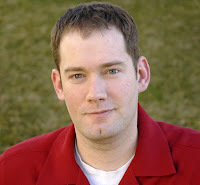 Let me introduce you to Brandon Mull. so through high school and college I mostly practiced by writing short fiction. After graduating from Brigham Young University in 2000, I started working on my first full-length novel. It was rejected by many agents and publishers before an editor at Shadow Mountain Publishing found promise in it. Shadow Mountain did not purchase that first book, but they asked to see something else, and the book I wrote for them was Fablehaven. So Fablehaven was published by the first publisher who saw it, after I did a lot of work shopping around that first book. The first book has not yet been published, but I expect to rewrite it someday and show it to publishers again. I am now contentedly living my dream. Between writing and promoting, I work more hours in a week than I ever have, but I am passionate about the work. I love my wife and kids a ton, and am relieved to be supporting them by doing a job I adore. I've never heard of this series, but this makes me want to check them out! Oh! Oh! I LOVE this series! I got hooked last year and they are one of my top fave fantasy books for kids! Fantastic writing, fantastic plot and characters that make me feel something!! (Like how I would like to smack Seth upside of his head often. heh). I have reviewed all pbs on my blog. Am waiting for the current one to come out in pb before I buy it. Thank you for this! I am so happy to have seen this post today! I will have to try and read this! It looks so interesting! I love Fablehaven! It's such a fun series. I haven't read the fourth installment yet, but it's on my list. YEAH FOR AN INTERVIEW!! I love his books!